"Another test?! Doctors during our time never prescribed so many tests", this was one of the common statements I heard during my both pregnancies. Having delivered two kids, I can vouch for the fact that hormonal changes in a pregnant body can wreak havoc. Thankfully, both my pregnancies were healthy with minor glitches here and there. Both the times, my husband and I made sure we don't leave any stone unturned as you never know what is there in store for you. Pregnancy is a complex phenomenon and certain things especially hormones are beyond your control. Especially, in these times, when women consider having baby in late twenties, thirties and even forties and when everything like water, food, air is not so pure. In this post. I would take into account a very common problem women can have due to a change in the way body responds to the hormone insulin during pregnancy - gestational diabetes (GD). Yes, it is a common problem because unfortunately, there's no way to guarantee that a woman won't get GD. It usually disappears after pregnancy but women with GD and their children are at an increased risk of developing type 2 diabetes later in life. And most women who get diagnosed with GD don't show any major symptoms. It is because of these reasons, that doctors these days don't want to take any chances and monitor all the necessary parameters from the beginning of a pregnancy. 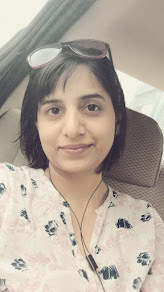 Both times I had my sugar levels tested at different intervals and still, there was a time when my baby weight suddenly shot up and my gynecologist doubted if I had GD. This when I had no uneasiness, no family history of the disease. And I tell you, those tests are not easy for a pregnant lady. Fasting and then drinking glass full of glucose to test how efficiently your body produces insulin is a difficult task in the first trimester when you are trying to cope up with so much of hormonal changes going inside. Still, it is one of the important test you must get done in order to enjoy a healthy and full term pregnancy. I would like to share with you five things that is in your hands which can make your experience comfortable and can help preventing any major issues. Yes, this looks a very simple advice but believe me those invisible entities called hormones are at their wackiest best during this stage. One moment you are on top of the world, all ecstatic about the baby in making and the next moment you are down the drain, about well, it can be anything - relatives, housework, office colleagues anything can make you feel overwhelmed and you find yourself in the puddle of tears. Cry, if that's what you want but then try to rebound back. The more you are stressed out, the more crazy your hormones behave. It is very essential to be calm and happy during your pregnancy to avoid any complications. Again, you shouldn't overdo eating while also, you can't starve yourself. Yes, in my case it was the latter. Baby will anyways take what it wants but for your own energy levels to remain balanced it is required you eat frequently. Most importantly, to prevent gestational diabetes from happening or while coping with it, you should be eating healthy, balanced diet in small portions every two hours. Eating salads, fruits, protein rich foods; drinking juices, buttermilk, milk are some of the options that appeal to every kind of pregnant taste bud. Do not skip your routine check-ups even when everything seems normal. I used to look forward to all my meetings with my doctor and always carried a list of any kind of doubt I had. Many of them looked stupid, lame questions but a good doctor is always patient and ready to address any kind of suspicions you have. Get all the tests done diligently and sincerely. In case, one has been diagnosed with GD, it's possible to have an uncomplicated pregnancy and healthy baby. One has to follow the right treatment and careful management, that includes apart from eating balanced diet and exercising, monitoring your blood sugar regularly using a Blood Glucose monitoring device. There are numerous monitoring devices available in market. When chosen wisely, it can help you in managing diabetes routinely without burning a hole in your pocket. 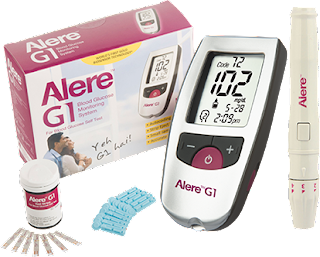 If you are looking for one, you may want to try Alere G1 Glucometer*. It is a convenient auto-coded device that takes away your daily monitoring hassles. With a special strip ejector, the device offers the ability to discard the used test strip without having to touch it. Moreover, the test strips are very attractively priced. Alere G1 offers quite economical test strips in the market. It is the test strips that we need to buy regularly and most often we forget to compare this aspect when considering buying a glucometer. Alere G1 gives good value for money. The gold electrodes ensure that the accuracy of the device is one of the highest. Do compare your Alere G1 test results with lab to get a sense of accuracy, let me know if you get disappointed! ~ Ability to maintain 5 different patient profiles - this means one glucometer can maintain separate records for 5 users! There are plenty other features you will be able to see in the manual. So, go ahead and try! Unlike regular diabetes, GD can affect two bodies, a woman and her baby. So, it is of utmost importance that an expectant woman be aware of her sugar levels throughout her pregnancy. Following these 5 steps can ensure that the unborn and mother are healthy and delivery becomes a pleasant experience. *This post is sponsored but views expressed here are personal.